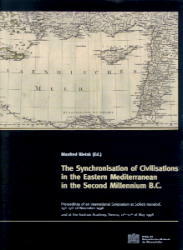 The Synchronisation of Civilisations in the Eastern Mediterranean in the Second Millennium B.C. It is in the Eastern Mediterranean where the cradle of those civilisations which shaped Old World history can be found. Taking a closer look at the 2nd Millennium B.C., the chronologies of these civilisations differ as much as 150 years or more from one region to the next. This kind of disparity would make the writing of history quite a problem. This is why it ls imperative to use every effort to try to build up an overall chronological framework for this region to help tie up events from one place correctly with events in others. Only then can a sounder foundation for writing history be built. dendrochronology and “the practicability of 14C dating for the absolute Chronology of the Eastern Mediterranean Cultures in the 2nd Millennium BC”. This is followed by a review of relevant archaeological projects: Egypt, Israel/Palestine, Jordan, Syria, Lebanon, Anatolia, Cyprus, Crete and the Aegean. A fair part of this research programme has since been approved by the Austrian Science Foundation (FWF) for the Austrian Academy. It is clear, however, that what such a programme needs is broad international support and cooperation. This volume should therefore be taken as an open invitation and a cue for the international scholarly community to join in. Im Bereich des östlichen Mittelmeeres entstanden jene Kulturen, welche die Geschichte der Alten Welt entscheidend prägten. Im 2. Jahrtausend v. Chr. jedoch weichen die Chronologien einzelner dieser Kulturen um bis zu 150 oder mehr Jahre voneinander ab, was für die Geschichtsschreibung ein bedeutendes Hindernis darstellt. Es ist daher unumgänglich, größte wissenschaftliche Anstrengungen auf die Errichtung eines überregional einheitlichen chronologischen Rahmensystems zu konzentrieren, um historische Ereignisse einer Region in eine chronologisch korrekte Beziehung zu Ereignissen anderer Regionen stellen zu können. Der vorliegende englischsprachige Sammelband bietet kein solches System an, aber er skizziert ein Forschungsprogramm mit dem Ziel der Etablierung eines solchen überregionalen chronologischen Rahmens. Er enthält naturwissenschaftliche, historische, archäologische und anthropologische Studien, u.a. zur Astrochronologie, Dendrochronologie, der 14C-Methode, der Anwendung quantitativer Methoden in der Chronologieforschung, der Datierung des Thera (Santorin) Vulkanausbruches u. v .m.